Well, this was actually only my second time up to Hawk Hill to try to capture a foggy scene, but I found my excursion a couple days ago endlessly frustrating (as I ranted about here). Again today, I suspected the conditions were good for the view from Hawk Hill (as Sutanto clearly demonstrated here), but I got up there around 7:40 and it sucked. It was just plain lousy. There was essentially no view at all. I stuck it out for about a half hour to an hour waiting for it to clear and conditions only got worse. I was about to bail out but ended up doing one long exposure. Well, in that 30 seconds the moon popped out into view. So I stayed until about 10pm and watched this scene unfold. 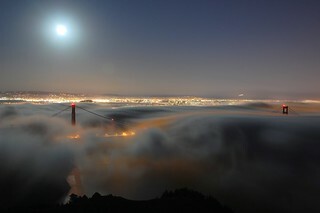 The moon rose over the fog and lit it up from above. The fog started to clear out revealing the bridge again, and the city lights in the background started to come out. Whether taking photos or just taking in the view it was an amazing night up there - I could have stayed for hours to take it all in if it wasn't for the nagging reality that I have to go to work in the morning too. Regardless, I'm glad I stuck around just a little bit longer and was rewarded with some beautiful views of the golden gate.